It may have been subconscious but I might have Rick Stein to blame for this meal. When I mentioned my visit on Twitter several people mentioned his most recent culinary journey across Mexico. I had thoroughly enjoyed it myself and did have a craving for the flavours that are so often relegated to the Tex-Mex of big chains. Recent years have seen the likes of Bar Burrito and Tortilla open with a focus on the fast food end of the market but little other than that if you wanted proper Mexican food. El Capo is looking to fill that void having opened in the second half of 2017. It’s taken over the Broad Street location of The Rum House and has had an attractive refurb on the face of it. A bar and wall of geometric tiling added some colour to the background palate of black and purple. Closer inspection revealed their Day of The Dead inspiration, the walls covered with crosses, a disconcerting backdrop to the meal. They have an extensive selection of Tequila and Mezcal but we enjoyed the American IPA Lagunitas. It was pleasing to see the menu was a little more than just burritos. I did have a burrito though, pulled beef (£9) from the choice of 3 meats, 1 fish and 2 veg options which was nice to see. Despite a greater range of dishes they weren’t overly exciting or ambitious and at least a burrito gives a good opportunity to compare with other establishments. I had hoped that a small plate of “Elotes”, sweetcorn with chilli and manchego, would bring a bit of glamour but unfortunately they didn’t have any. My second choice, advocado tostada was also not available due to them running out of avocados. In a Mexican restaurant that’s even more disappointing. I ended up going with some nachos (£6) topped with some slow roast pork shoulder. A tortilla filled mostly of rice isn’t going to look great at the best of times but this was somewhere between beige and khaki. The meat was tender but neither it or the jalapeno salsa did much to stimulate the tastebuds. I wondered how much the flavour had been diluted by the rice, but the separate sample had the flavour of something more at home in an English dish rather than Tijuana. Nachos did little to cheer me up (at least they weren’t supermarket tortilla chips). Not bad, just lacking inspiration… though I was pleased to see some avocados had once graced the kitchen as a pot of guacamole accompanied the pile of cheesy triangles. Service was just about fast enough but it often seemed the staff were preoccupied with spending time on laptops or talking amongst each other rather than being more efficient. Whilst El Capo won’t break the bank in charging you £9 for a pretty filling dish I struggle to have too many good things to say about it. 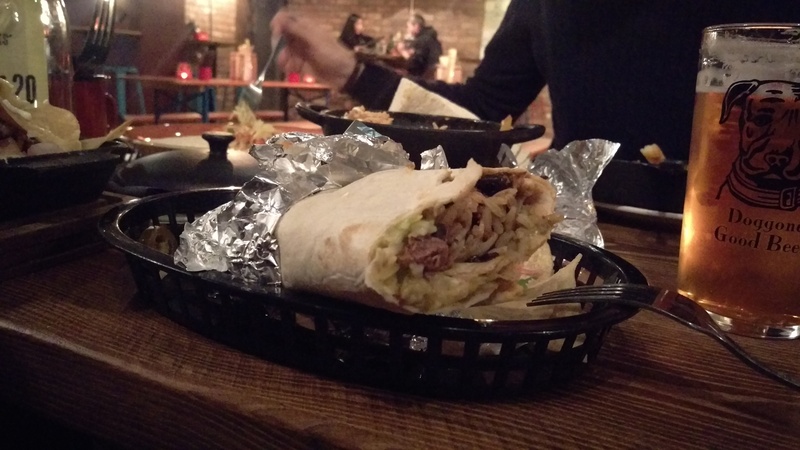 Even if we propose value as its best asset a burrito at Tortilla (at £6.40) is the cheaper of Nottingham’s ‘Mexicans’, Bar Burrito comes in at less as well (at £7.80) and both are frankly better than El Capo. Sure they don’t provide such a comprehensive experience in terms of menu and table service of course but I am happy to forgo that for the sake of the best food. N.B. The term “El Crapo” was considered for this article but deemed a bit vulgar, too harsh and a cheap shot. A Mexican Resturant with no advo’s means no guacamole maybe in Nottingham you have Macdonalds without serving burgers? You might not believe me but apparently some people have salad at McDonalds! Either way I think this guac was pre-prepared. Hopefully by the restaurant and not Mr Sainsbury!